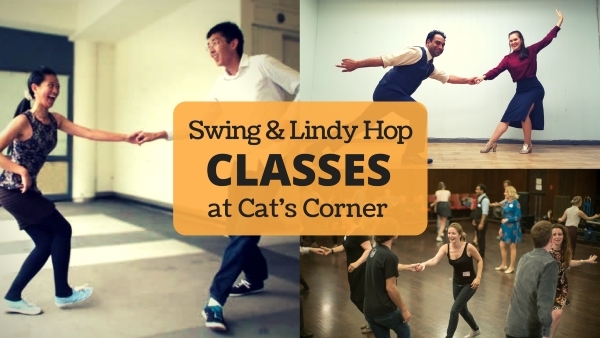 Our next session of Lindy Hop and swing classes starts soon on February 7th, 2018 and will feature 3 weeks of classes at Swedish American Hall (Feb 7, 14 & 28) plus an optional mini-workshop evening on February 21st at the Ukrainian American Hall. Join fun classes with resident teachers Nathan & Chiara or guest teachers Sam and Calvin! Beginners welcome…and no partner needed! Dance to live music after class each week…and learn to swing in time for Valentine’s Day! 7 & 8pm Series Cost: $50 early registration online by Feb 5. $55 full price online. $60 door. ← January 3rd, 2018: Cat’s Corner Reopens at Swedish American Hall!